Two page news release. Includes one page Memorandum. 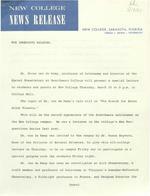 MEMORANDUM TO: Mr. Arthur DATE: 1 March 1965 FROM: A. Sayvetz RE: Visit of Dr. Peter van de Kamp Lecture8:00pm, Thursday, March 18, 1965. "The Search for Extra Solar Planets" Music Room, College Hall Open to 1. Science teachers 2. High school students 3. Public Dr. Peter van de Kamp, Professor of Astronomy and Director of the Sproul Observatory at Swarthmore College, earned his Doctorates at the University of California, Berkeley, and Groningen. He has been an investigator at Lick Observatory, Member and Professor of Astronomy at Virginia's Leander-McCormick Observatory, a Fulbright Professor to France, and Program Director for Astronomy with the National Science Foundation. Dr. van de Kamp is currently President of the Commission on Double Stars of the International Astronomical Union. His research interests include stellar motions, solar motions, and astrometric studies of nearby stars. On Friday, 19 March, following dinner, there will be forum with a showing of Charlie Chaplin's Monsieur Verdoux, 7:30pm.